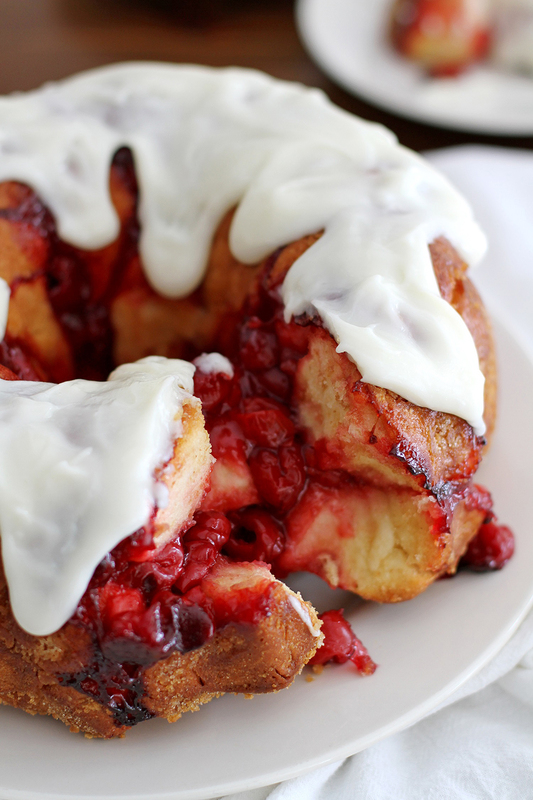 Have dessert for breakfast with this decadently delicious Cherry Cheesecake Monkey Bread, filled with layers of cherry pie filling, graham cracker crumbs, soft pull-apart dough and a cream cheese icing. In a small bowl, dissolve 1 Tbsp sugar and yeast in warm water. Let sit 5 to 10 minutes until foamy. In a large bowl or bowl of a stand mixer, combine 3 cups flour, dry milk powder and salt. Add milk, melted butter, egg and yeast mixture; stir until a dough forms. Turn dough onto a lightly floured surface and knead by hand 10 minutes, adding just enough of remaining 1¼ cups flour until dough is smooth, elastic and slightly sticky; OR, knead dough 5 minutes in stand mixer using dough hook on medium speed, adding just enough of remaining 1¼ cups flour until dough is smooth, elastic and slightly sticky. Shape dough into a ball and place in a large, lightly greased bowl; turn to coat. Cover bowl with plastic wrap and let dough rise in a warm place 1 to 1½ hours until doubled. Meanwhile, in a medium bowl, combine graham cracker crumbs and sugar for filling/coating. Melt butter and place in a small bowl. Grease bottom and sides of a large Bundt pan with baking spray or softened butter. Punch down dough. (*see note) Divide dough into 1-inch pieces; roll each piece into a ball. Dip each dough ball into melted butter, then roll in graham cracker-sugar mixture. Place in prepared pan. Once bottom of pan is covered with dough balls, spoon half of cherry pie filling over top. Top with another layer of dipped and coated dough balls. Top with remaining cherry pie filling. Top with remaining dough balls. Cover pan with plastic wrap; let rise 45 minutes until nearly doubled. Meanwhile, heat oven to 350°F. Unwrap pan and bake 40 to 45 minutes until bread is a very deep golden brown on top and filling is bubbling. Cool in pan 10 minutes, then carefully invert bread onto a serving plate. Beat icing ingredients with an electric hand mixer or in a stand mixer until smooth (add more powdered sugar or milk as needed to achieve desired consistency). Spoon and spread icing over top of bread. Serve warm or at room temperature. *At this point, dough can be refrigerated overnight for use the next morning. Just punch dough down, shape into a ball, and return to greased bowl. Cover with plastic wrap and place in fridge. The next morning, let dough sit in bowl at room temperature 45 minutes to 1 hour before proceeding with recipe as directed.